Northcenter Neighborhood Association is hosting an evening of "Music in the Garden," featuring Steve Frisbie and Liam Davis. Please bring your own chair, you will sit in the aisle among the garden plots. The ground is gravel and metal, not suitable for blanket seating or picknicking. There is no rain or alternative date for this group. Montrose Green is located at 1819 W. Montrose, adjacent to the Montrose Brown Line station. 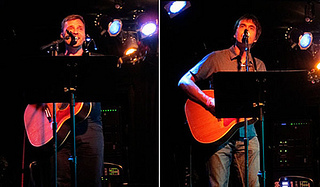 With their spellbinding vocal harmonies, Steve Frisbie and Liam Davis fronted the power pop band Frisbie in the early 21st century. Each has moved on to individual success (with Davis earning a Grammy nomination), but they continue to nurture their special connection. With talent, good fortune, and hundreds of gigs on their side, Frisbie and Davis keep lifting their voices higher. For more information go to their Facebook page and Liam's website.